EDIT: here looking for the page? It’s going to be posted later Friday afternoon or evening–I’m sick as a dog. It’s mostly done, but I need to dump an entire bottle of vicks vapour rub on my torso and attempt to get some sleep now. Whew, was working on this one right down to the wire. This past weekend was crazy–the book is done being edited and has been sent off to the publisher. I’ve seen a digital proof of it and I’m really pleased with the results. I also added a bunch of fun bonus stuff. 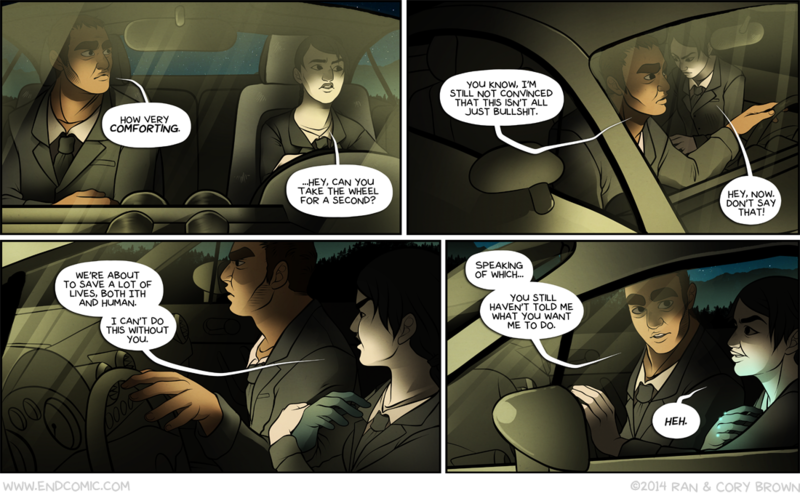 Anyhow, I plan on spending the rest of the week finishing up the digital package so that all I have to do is add the PDF version to it when Megan sends it to me, as well as finishing up Friday’s page which is flatted and not coloured. Gonna sleep now! Enjoy!